These were the last of the performances by the Beatles in person on the Ed Sullivan show. The songs performed were I'm Down, Ticket To Ride, I Feel Fine, Yesterday, Act Naturally and Help. 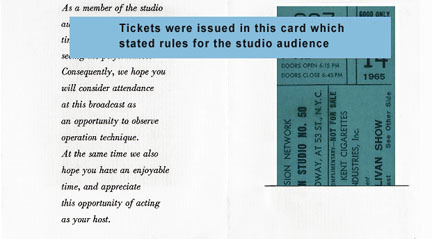 Both the dress rehearsal and the taping were performed before a capacity live audience of only 728 people. The show was not broadcast live, but transmitted a month later for the season premier of the Ed Sullivan Show on September 12th, 1965. Other acts performing were Cilla Black, Soupy Sales, Allen & Rossi and Fantasio the Magician. Tickets for either the dress rehearsal or performance are just about impossible to find. So far only four unused tickets are known to exist for the six ticketed Sullivan performances - one for the original February 9th performance and three for the August 1965 show. Remarkably, only a few stubs have turned up for all of the rehearsals and performances combined. 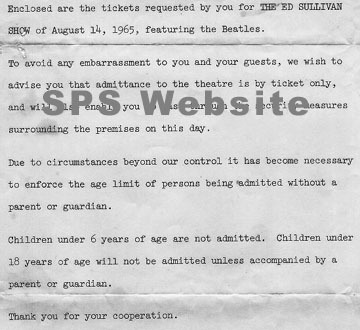 One of the letters that was enclosed with the tickets explaining rules about the age limit requirements.